Bumrah also paid credit to his coaches through the career and especially talked about Bharat Arun. Bumrah's best delivery came when Shaun Marsh was trapped lbw with a slower yorker at the stroke of lunch. 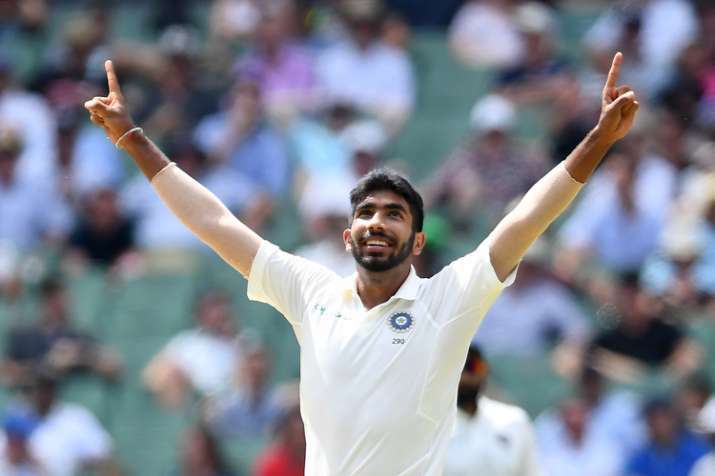 Jasprit Bumrah said his experience of getting reverse swing on slower pitches in first-class cricket helped him get the best out of a docile MCG track after his six-wicket haul put India in command in the third Test here. Bumrah's produced a career-best effort of 6/33 in 15.5 overs, becoming the first bowler from the subcontinent to take a five-for or more in South Africa, England and Australia in the same year. "When I was bowling there, the wicket had become really slow and the ball had become soft... I tried to bowl a slower one, a fuller slow ball. Maybe it will dip or go to short cover. It worked because the ball had started reversing," Bumrah said on Friday. "When we play on similar wickets back home, the ball reverses. So you try to make the most of it. We were trying to use our experience in First-Class cricket where we have bowled with reverse-swinging balls. That was the plan," he added. Bumrah's exploits helped India bowl out Australia for a meagre 151 in the first innings on the third day of the Boxing Day Test. In fact, the pacer returned with 45 wickets in nine Tests this year and Bumrah said he isn't surprised by his rich vein of form in his maiden season in Test cricket. "I am not surprised. If I say I don't believe in myself, who else will? I just try to back myself in any situation that I go. Yes the start has been good and I have played in England, South Africa and here three different kinds of conditions," said Bumrah. "Yes I have not played a Test in India but whenever you go to different countries, you have new learning and experiences from playing in every country. I have had a good start and let's see how it goes further. "I always wanted to play Test cricket, but people have only seen me in first-class cricket. I was always confident that whenever I get a chance I would be able to do well. Hopefully, I can keep on learning and keep getting better," he added. This was his third Test five-wicket haul after Johannesburg and Nottingham, where India won on both occasions. They are now primed for victory in this third Test as well, after leading by 346 runs overall despite finishing at 54-5 following a mini-collapse in the second innings. Bumrah said that although the second innings didn't go to plan, India will try to get as many runs as possible on day four before turning their attention to bowling out Australia for a second time. "There were no such plans (after batting on). We just wanted to play positive cricket. Yes, we lost a few more wickets than we wanted to but we will try to add as many runs as we want to and, hopefully, when we come back in the next innings (to bowl), try to get them out as well," he said. "We have bowled a lot of overs as well. We are not focussing on that (tiring out Australian bowlers). We are focussing on our plans what we have to do tomorrow morning or whenever we start to bowl, how the wicket is behaving and what purchase we are getting." Only seven wickets came on the first two days, but 15 wickets fell on day three. "...last ball before lunch, Rohit Sharma was there at mid-off and he told me you can try a slow ball like you bowl in one-day cricket," he said. "So, I thought yeah, I could give it go... maybe a slower ball there and some of their guys play with hard hands, so I wanted to try that. The execution was good on the day." There were questions raised about his bowling action but Bumrah said he never paid them any heed and instead worked on his strength. "Let people say what they want (about my action). I don't take seriously the talk about my action. In my childhood, I used to watch a lot of cricketers bowling so I don't know how and when I developed this action," he said. "But whenever I have gone to NCA or anywhere, nobody tried to change my action. I was just asked to strengthen my body because, they thought, I can lose my pace. I have been a bit lucky in that aspect." Bumrah also paid credit to his coaches through the career, and especially talked about Bharat Arun, for backing him despite his unorthodox bowling action. "First time when I went to the NCA, Bharat Arun was there and he saw my action. I have been lucky in that he saw my action and he didn't want to change that. He always believed that with this action I have to become stronger and won't change your action," he said. "Instead we will work on the consistency and everything else will follow. I have been lucky enough to work with such coaches who didn't try to change me but always told me to back myself.